Whilst it would not be a good idea to bring everything bar the kitchen sink into hospital if you are going to be an in-patient for a few days, there are some items which are essential to bring with you and others which might make you stay a little more comfortable. However, with the non-essential items, you may need to check with the hospital first to see if they allow you to bring certain items. In many cases, when a hospital writes to you to let you know your date of admittance, they’ll often include a checklist of things to pack and any items that you’re not allowed to bring with you. Here is a list of some of the essential and non-essential items you may wish to consider packing. Most hospitals will usually allow you to wear your own pyjamas or nightdress and, if you have a dressing gown, it’s a good idea to pack that too. With pyjamas, however, you need to ensure that they are designed in such a way that they won’t interfere with things like IV tubes, drips and drains etc. Also, bring a pair of slippers with you but make sure they have good traction as you’ll not want to slip over. Some people prefer to bring light canvas training shoes or plimsolls instead. Also, you may wish to bring a change of day clothes for the day you go home. Although a hospital will be able to provide you with your basic toiletries needs such as soap, shampoo and toothpaste, you may prefer to bring your own if you have particular preferences. Your own preferred toilet paper and tissues are also items which you may want to consider bringing. If you have long hair, don’t forget to pack a hairbrush. Deodorant and a razor and shaving cream are other items you may wish to pack. Many people get used to their own pillows and find it difficult or uncomfortable to sleep without them. However, because of sanitary reasons, you might need to check with the hospital first to see if it’s OK to bring your own. You can become bored very easily in hospital, especially if you are in there for a number of days. Therefore, although it might be possible to have a daily newspaper delivered to your bedside, you might wish to bring along a few magazines, a book or puzzle book or a pack of playing cards. If you prefer your entertainment to be a bit more high-tech, you might want to bring along a walkman or MP3 player or a small hand-held games console. However, with any battery or electrically powered item, make sure that you are permitted to use it first. Similarly with mobile phones, the use of them in hospitals is becoming more widespread but you’d need to check that out first. It may be that if you’re in a private ward, you have free rein to use your mobile whereas some hospitals may permit you to make calls using a mobile but only in designated areas, often outside the hospital building. Bring along a little money in case you need to buy anything from one of the hospital shops. It’s also useful to bring a bit of change with you for things like payphones, for example. 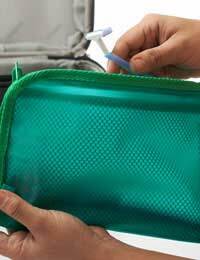 Depending on your needs, you may also have to remember to pack items such as glasses or contact lenses, dentures and hearing aids. It be also be a good idea to pack items such as ear plugs, a nightlight if you prefer your door closed and shoes with a non skid sole. The important thing to remember is that you’re going to be somewhat limited by storage space. This is not a hotel trip after all and, if you’re on an open ward, your space will be even further confined so just pack the essential items and a few other home comforts. And, if you’re in doubt about whether or not a particular item is permitted, it’s always best to check with the hospital first. And, if you have forgotten something important, you’ll no doubt be receiving visitors who will be able to bring those items along for you.